Mittwoch, 26. September | Bürgerinitiative Umweltschutz Lüchow-Dannenberg e.V. Etwa ein Dutzend Aktive und Interessierte nahmen an der PK teil, 5 Reporter*innen waren gekommen und Greg Harman, Clean Energy Organizer beim Texas Sierra Club hat einen Videomitschnitt gemacht, den wir hier posten. 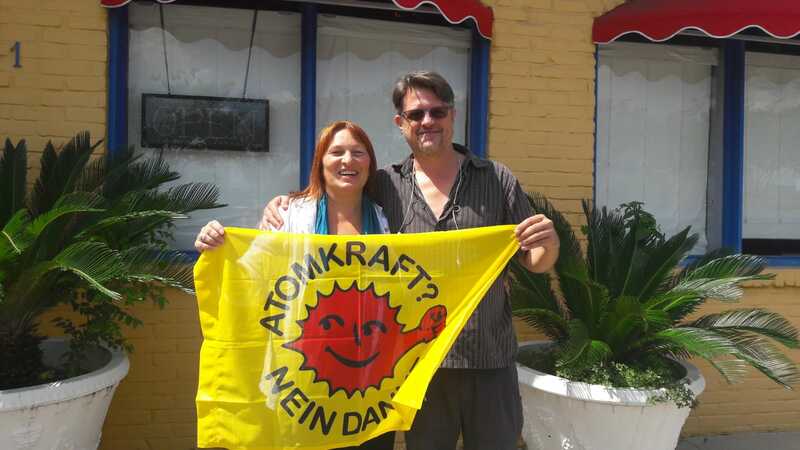 Die Anti Atom Initiativen sind hier durchaus aktiv, doch es fehlt der Funke für eine größere Welle von Interesse und Aufmerksamkeit und letztlich Bewegung und Aktion. Die Diskussionen waren wieder sehr spannend, doch nun gehts zur Abendveranstaltung im EcoCentro in San Antonio, wovon ich dann mehr berichten werde. Schaut euch die Bilder und gern auch das Video an!! 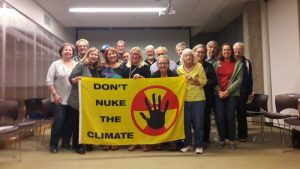 Dallas,Texas – The public has until October 19th to speak out against the plan to dump the most dangerous radioactive waste in Texas, waste coming from nuclear reactors around the country. 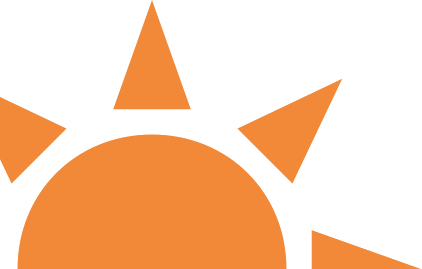 A high-risk, high-level radioactive waste dump is proposed in Waste Control Specialists’ re-started license application with the Nuclear Regulatory Commission (NRC). 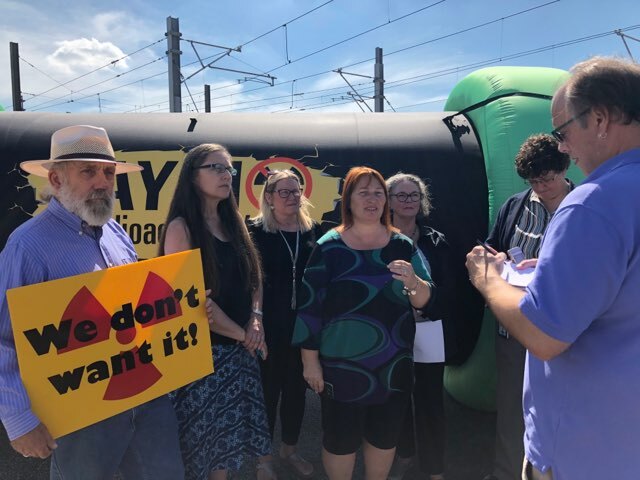 Local community members, Public Citizen, Sustainable Energy & Economic Development (SEED) Coalition and Nuclear Information and Resource Service (NIRS) held a press conference today near railroad tracks to point out the risks of accidents, leaks or terrorist actions if the waste is transported through San Antonio. 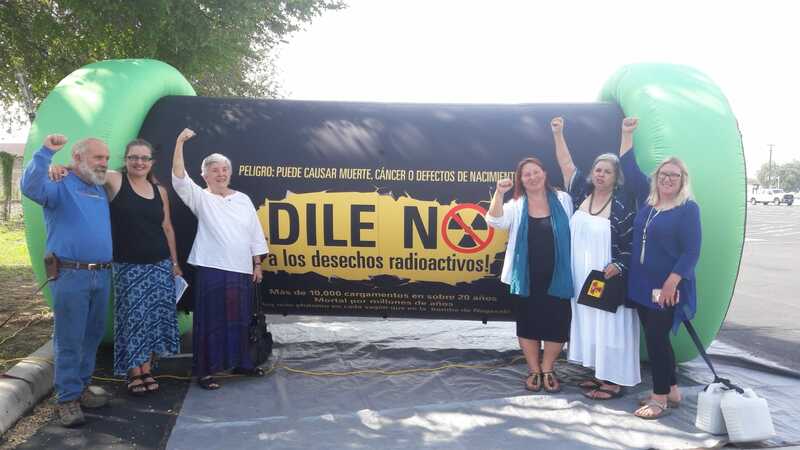 They noted that the clock has begun ticking for public input, and that public opposition has stopped the siting of radioactive waste dumps in the past. 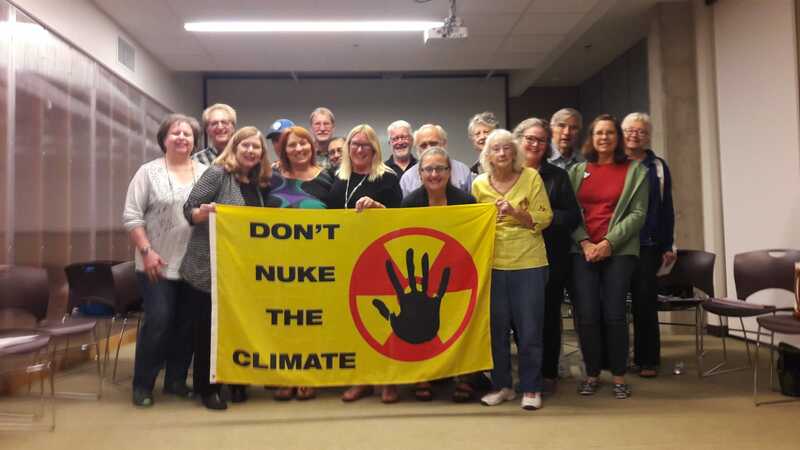 Kerstin Rudek, with Citizen’s Environmental Initiative in Gorleben Germany, spoke about the high-level radioactive waste storage experiences of her community and warned people to fight. Erin Moore read a statement on behalf of Dallas County Commissioner Dr. Theresa Daniel, whose strong resolution on this issue passed unanimously. Waste Control Specialists (WCS) seeks to bring in by rail 40,000 tons of irradiated fuel rods from nuclear reactors around the country and store it at their existing low-level radioactive waste site stored for 40 years, although the application says that it could be up to 100 years, risking creation of an unsafe de facto permanent disposal facility. This deadly waste must be isolated from people and the environment for a million years. Exposure to radiation can cause cancer, genetic damage and birth defects, and being close to unshielded waste is lethal. The least risky approach to dealing with high-level radioactive waste would be to keep it at existing reactor sites, or nearby, and use more robust canisters and casks. There’s no need to move the waste anywhere and no need to centralize it, since a permanent repository is not available. Spent nuclear fuel can be kept onsite in dry storage for 60 years after reactors cease operating. 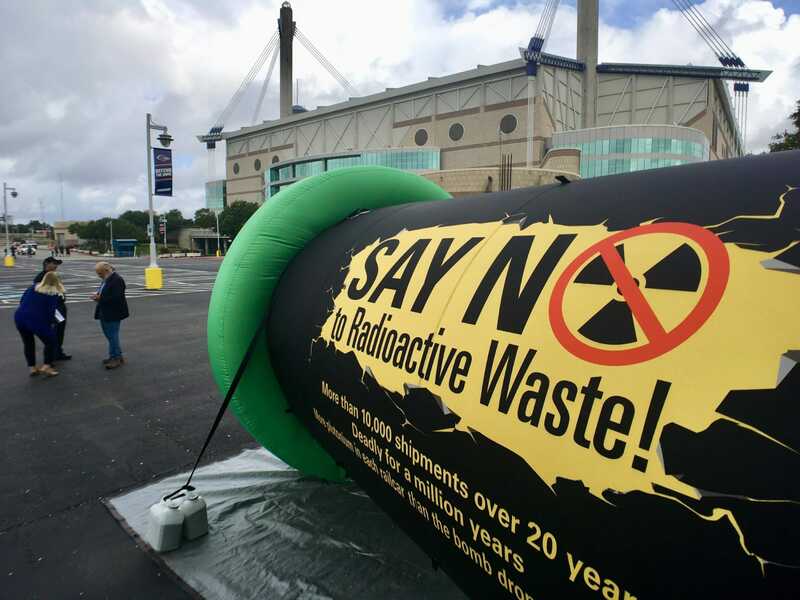 The Protect Texas from Radioactive Waste Tour will go to major cities across the state with an inflatable full-scale mock radioactive waste transport cask and hold press conferences at railroad crossings where the radioactive waste could travel and host community meetings. See www.NoNuclearWaste.org. The public can comment on the license application until Oct. 19th. Comments on WCS/ ISP’s Consolidated Interim Storage Facility should include Docket ID NRC-2016-0231, and be emailed to WCS_CISF_EIS@nrc.gov. Comment letters can also be sent from www.NoNuclearWaste.org. An October 2008 report prepared for the State of Nevada – Potential Consequences of a Successful Sabotage Attack on a Spent Fuel Shipping Container: Updated Analysis Revised Final Version was prepared by Radioactive Waste management Associates (RWMA.) Dr. Martin Resnikoff found that cleanup costs following sabotage events in which casks were penetrated but not perforated, similar to analysis by DOE, could range from $3.5 billion to $45 billion. Transportation sabotage events in which the casks are fully perforated could result in cleanup costs of $463 billion to $648 billion.